Give those around you affected by Lymphoma encouragement every time you wear this Lymphoma Awareness T-Shirt. The eye catching design along with many t-shirt colors is sure to get you noticed. Help show support for the cause and spread awareness today with our inspiring Lymphoma Awareness Shirt. 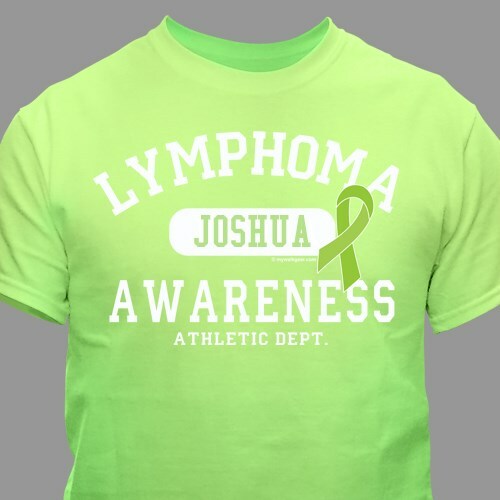 Our Personalized Lymphoma Cancer Shirt for Awareness is available on our premium 100% cotton T-Shirts, machine washable in youth sizes XS-L and adult sizes S-3XL. Includes FREE Personalization! Personalized your Awareness Shirt for Lymphoma Cancer with any name. I actually got the black shirt with lime print, and it is AWESOME. VERY high quality, the shirt itself is a Gildan, the BEST in my opinion. I am MOST happy that this company actually DONATES money to the cause of your choice. Top Notch people AND products. My rating is actually 10 Stars. Just picked up my t-shirts I had ordered from you, and my wife and I can't be more please with the shirts we got to help spread Lymphoma Awareness everywhere we wear them. Thank You Timothy M. - Windsor ON. Canada. I absolutely love the shirt! I am wearing it now. My son Cameron is affected with this type of cancer. He was very pleased when I gave him his shirt. The shirts I ordered look really great. As someone in remission with Lymphoma being able to peronalize the shirts gives me a more positive outlook. Thanks MyWalkGear! I am impressed with the quality of the shirts I ordered. I discovered the site through an ad on Facebook. The half price offer gave me incentive to try your company even though I had never heard of it before. Highly recommend this site to everyone. We are doing a Lymphoma Walk Sept 22 and will wear these amazing shirts with pride! My 24 yr old daughter is currently being treated for Hodgkin's. Take a look at our ever growing collection of Lymphoma Awareness Apparel and Walk Gear to show your support today. Walk in style with this Lymphoma Cancer Awareness T-Shirt or our Lymphoma Cancer Hope Long Sleeve Shirt at your next awareness walk. Be sure to also take a look at our Lymphoma Cancer Hope Tote Bag to show your support every day.